PowerObjects is honored to win the award for the third year. Living our Core Values under the guidance of our wonderful Leadership Team keeps our culture at the center of the company. 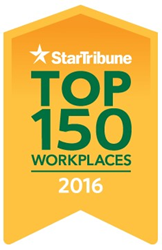 PowerObjects, an HCL Company has been named one of the Top 150 Workplaces in Minnesota by the Star Tribune. The Top Workplaces special section was published in the Star Tribune on Sunday, June 26. The report can also be found here. PowerObjects was ranked 42 on the midsize company list. "We are honored to be selected again this year as a Top Workplace," says Terah Ramaekers, Director of Talent Acquisition at PowerObjects. "Our employees are what make us a great place to come to work at each day. Without each member of our team, this wouldn’t have been possible. Living our Core Values under the guidance of our wonderful Leadership Team keeps our culture at the center of the company, even as we continue through unprecedented growth."